Found a weird thing in my server and we have absolutely no clue as to what it is. It's a random spot on the map where there is this weird black smoke and loads of enderman seem to spawn near it (10 when i last looked, all in the same 20 block radius. Changes because of the time of day). There can be more at times and we have never seen anything like it. I'd post a photo if I could. Is it from normal Minecraft, Tekkit or just a random glitchy oddity? It's from the mod Dimensional Doors. Use a Rift Sealer to get rid of it, because it can eat your world. I don't know first hand, it's just from the experiances of others. It spreads, and I think it can kind of overcome blocks or something. The last time I saw one was the middle of an ocean, and there was a rather large crater in the water. Hey - for those having this issue, and that have agitated their Rifts (don't put quarry on top of it!) to the point of no return (a major infestation) - I thought I would share my solution, that so far, seems to work. Ive searched around (trying to fix mine first) and didn't find much info on it, but this is what I found out on my own. First I deleted the Application Data\.technic\tekkitlite\saves\GAMENAME\DimensionalDoors folder. I replaced mine with a copy from an earlier backup. However I suspect that deleting the folder entirely will work. Next I loaded the game. The black sparkles, black ender smoke, or whatever you want to call it - was still there, but not spawning enders anymore. 1977 is the block name for the ender smoke stuff and 1 is stone. EDIT: Forgot to mention: in the mIDas app make sure to click Add Translation and be sure the 1977 is selected in the box to the left! From there just run the app on your tekkit saves folder. You will go from a mess of rifts that cause lag, to a bunch of stone! The mIDas app even told me there were like 1200 blocks of #1977 (rifts) so yeah.. major infestation! However I didn't do that yet. Not planning on letting it go this far again! Woohoo, now back to playing tekkit! Have fun all, hope this helped someone! I've found one of these weird rift things too but its far enough away from anything I'm not that concerned. Doesn't seem to be getting any bigger but maybe it doesn't if its in an unloaded area? I don't believe they do (correct me if im wrong) but the one I had started very small and I passed by it several times and seemed to stay the same. Its when I agitated it with a quarry on top of it that it started to grow. You can remove a rift by using a rift remover (ender pearl in the middle of a gold bar cross), or you can lock it by placing a dimensional door (ender pearl flanked by two iron doors on each side). The dimensional door on the rift gives you access to a pocket dimension which has a chance of having trapped temples with some loot inside, plus it disables the rift random conversion to air. Rifts and Dim. doors don't act as chunk loaders, so if the rift is not loaded, it doesn't convert stuff. 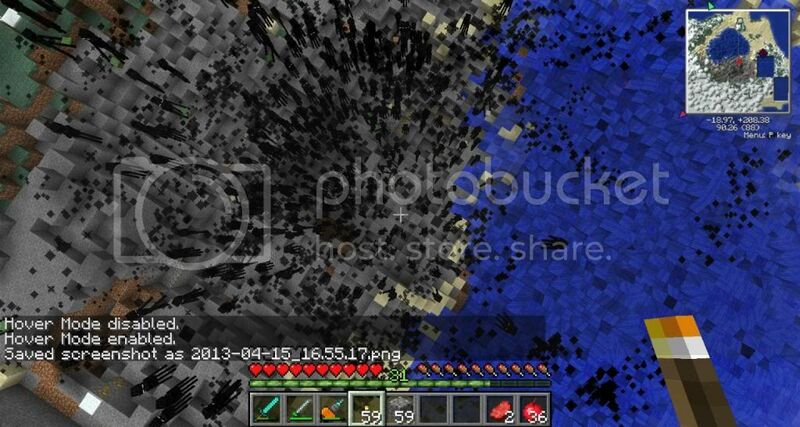 There could be two right next to each other, which would be why it's spawning enderman(that would make it a rift.). This crater thing though, maybe Decay from Mystcraft? Maybe decay coming from the other side of the rift? 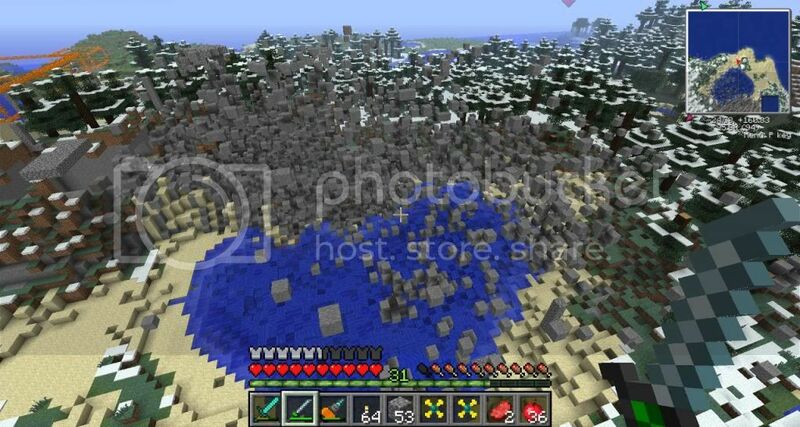 This crater thing though, maybe Decay from Mystcraft? The smoke spreads automatically. It eats blocks, causing a crater. This has crashed my minecraft now I can't get on to Tekkit haven't tried anything else in the Technic launcher but they might be broken deleted dimensional doors mod and it's still crashing can't get on to any of my Tekkit Lite worlds any help? Tekkit Lite crashes when I try to get in a world as well. Any world! Both of you should submit bug reports in the Tekkit Lite Bugs section, you'll get far more help there. Make sure you fill in all the details, because there is literally nothing anyone can do to help you with what information you gave here. By the way, MorganB, if you've removed DimDoors and it's still not working, chances are it's not a DimDoors problem. The problem is that it will come back in a few hours.